The Eagles run past Medomak Valley 79-29. 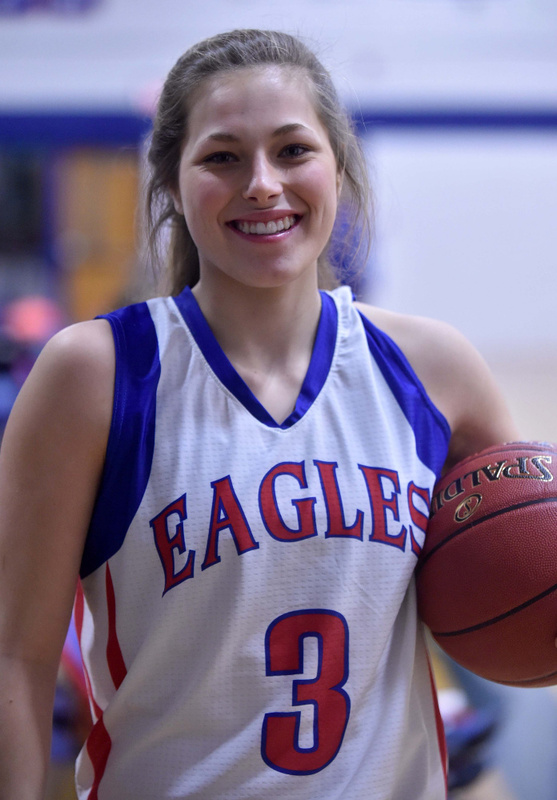 OAKLAND — Senior Sophie Holmes registered her 1,000th career point as part of Messalonskee’s 79-29 win over Medomak Valley in a Kennebec Valley Athletic Conference Class A girls basketball game on Thursday night. Holmes finished with 33 points for the unbeaten Eagles, netting points Nos. 1,000, 1,001 and 1,002 on a 3-pointer as the final buzzer sounded. Holmes scored 15 points in the final quarter en route to the benchmark. Derosby said he entertained removing her from the game on several occasions as the Eagles’ lead ballooned, but he kept Holmes on the floor at her teammates’ insistence. “She earned it all,” Derosby said. “She got them off rebounds and off steals and at the free throw line. Messalonskee, which also got 11 points from McKenna Brodeur, improved to 3-0 while Medomak dropped to 1-2. GARDINER 70, CONY 46: Lauren Chadwick had 22 points and five steals to lead Gardiner to the KVAC A win in Augusta. Leslie Stevens had 14 points for Gardiner (3-0), while Mary Toman had 10 points and nine rebounds. Sydney Avery led Cony (0-3) with eight points. RICHMOND 55, HEBRON 15: Sydney Tilton recorded a double-double with 20 points and 23 rebounds as the Bobcats remained unbeaten with the win in Hebron. Caitlin Kendrick added 15 points, including a pair of 3-pointers, and five steals for Richmond (3-0). Franceska Halloran led Hebron (1-2) with seven points. MONMOUTH 49, MOUNTAIN VALLEY 25: Abbey Allen had 12 points and nine rebounds to spark the host Mustangs to the Mountain Valley Conference win. Tia Day added nine points and six assists for Monmouth (3-0) while Katie Butterfield had seven rebounds and Abby Ferland seven steals. Mountain Valley (1-2) was led by Ashley Russell with nine points. BOOTHBAY 67, HALL-DALE 24: Faith Blethen scored 19 points, including four 3-pointers, to spark Boothbay to the MVC win at home. Page Brown added a game-high 21 for Boothbay (3-0). Kayla Searles led Hall-Dale (0-3) with seven points. HALL-DALE 68, TELSTAR 59: Alec Byron scored 22 points as the Bulldogs held on for the MVC victory in Bethel. Jett Boyer added 14 points for Hall-Dale (3-0) while Tyler Nadeau had 12 and Alec Roberts 10. Tanner Wheeler and Jared Dean each scored 17 points for Telstar (1-1). OAK HILL 59, LISBON 56: The Raiders overcame a 10-point fourth quarter deficit to pick up the MVC win in Wales. Marcus Bailey had 20 points and 13 rebounds for Oak Hill (1-1), while Darryn Bailey added four points and 13 rebounds. Evan Boston added 11 points and six assists. Jonah Sutter’s game-high 30 points led Lisbon (1-1). MEDOMAK VALLEY 54, MESSALONSKEE 42: The Panthers overcame a two-point halftime deficit to post the KVAC A win in Waldoboro. Kyle Donlin scored a game-high 22 for Medomak Valley (3-0). Nate Violette poured in 17 points for Messalonskee (1-2). Cole Wood added 10 points. WINSLOW/GARDINER 9, PORTLAND 2: In a game played Wednesday night, Sarah Morgan and Anna Chadwick (assist) both scored twice to lead the Black Tigers to the home victory. Evelyn Hinkley had a goal and two assists for Winslow/Gardiner, while Julia Hinkley had a goal and an assist and Katie Larsen and Liz Nadeau also scored. Cassandra Demers made 20 saves for the Black Tigers.